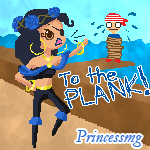 Puzzle Pirates Forums - View Thread - Do you know who made this avatar? Forums » List all forums » Forum: The Mariner's Muse » Thread: Do you know who made this avatar? So I'm trying to rather up all my old avatars (some of which are on my old laptop to which I've forgotten the password >.>), I think I know what Images I still need to locate and who drew them. However I have reattained one that I'm not sure who drew it, I have searched the past 30 pages of The Mariner's Muse and I'm not keen to have to repeat it :p I've probably missed it so if you could save me from further insanity that would be great! Unfortunately she used photobucket like me and all her images are dead. But the style is pretty noticeably the same from the examples on the yppedia. As a side note, I really need to update my examples there. Those are museum pieces. Yeah there's a couple from photobucket that I don't currently have (should all be on my old laptop though once I get into that). Stupid photobucket.